For Christmas, Hubby gave me a gorgeous old copper pan we found in a second hand shop in Bideford a few weeks ago. Not everyone’s fantasy Christmas gift, I grant you, but very much to my taste, I’ve been looking for something like it for some time, but every one I’ve seen has been exorbitantly expensive. Not so this one – a real bargain, as it happened! – but of course there’s always a catch, and the pan was in, well, shall we say ‘rustic’ condition? Well used, well worn, and yes, very stained and tarnished, both inside and out. Despite his best efforts with several rounds of ‘Brasso’ to try and make it presentable for its debut under the Christmas tree, it’s fair to say that still looked like a pan which had had rather a hard life! I took some advice, and after considering the various cleaning options, ordered some ‘Barkeeper’s Friend’, which of course has yet to make its way through the Christmas post. I’d also come across some advice that lemon juice and salt might do a useful job of getting tarnish and stains off copper surfaces. 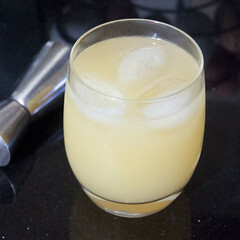 This morning I noticed a rather wizened half-lemon left over in the fridge, and thought, ‘hey, why not give it a go?’. All I can say is ‘Wow!’. It works startlingly well, even on the dark burned stains. I used a quarter of lemon at a time, working gently in circles with a bit of table salt. You can just see the colour changing in front of your eyes. 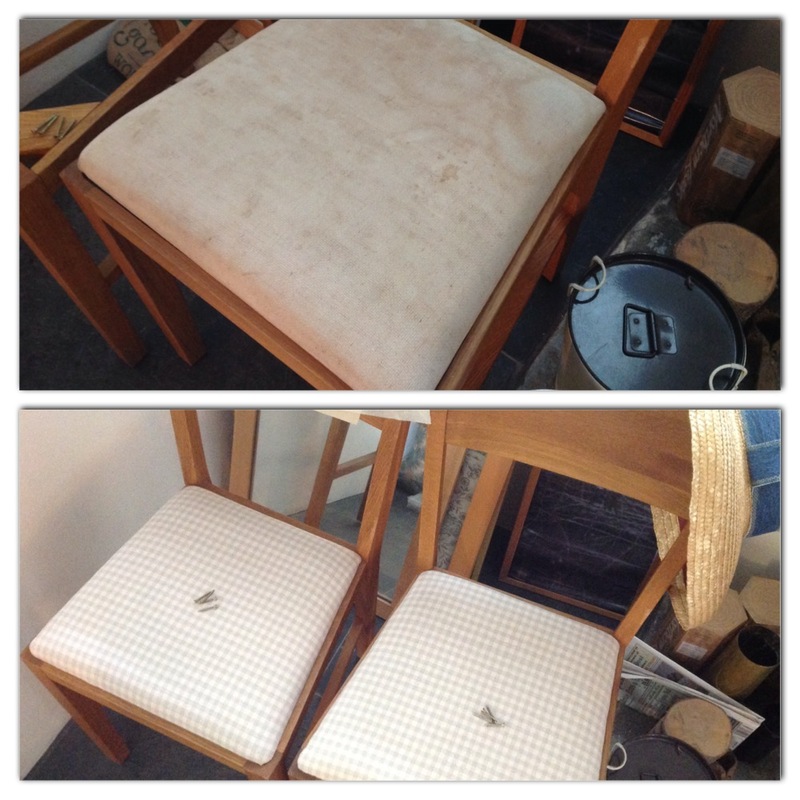 I was genuinely stunned by how quickly and easily this worked – so unexpected was it I didn’t think to take ‘before’ photos! Better still, the segments of lemon come along with their own natural gentle scrubbing pad. It’s not a perfect finish, by any means, but it’s a really decent clean that I would be more than happy to cook with, something I really couldn’t have said before! I think I’ll probably still try the Barkeeper’s Friend when that arrives, to see if I can get a slightly finer finish – but if I hadn’t ordered it already I don’t think I’d be bothering. I love the patination on the outside of the pan, so I’ve left that alone. Isn’t it gorgeous? I just can’t wait to cook in it now! Just a really quick, simple Christmas gift wrapping tip for you all tonight – I can’t even claim it’s original, since I saw the idea on Pinterest a few months ago, but it stayed with me as something cute, and really rather useful! Here’s a cheap, quick, attractive, and recycled way to wrap small gifts this holiday season, using only things you already have – the cardboard centre of a toilet roll (or kitchen towel roll, or the centre of a roll of wrapping paper), some small scraps of wrapping paper, and some ribbon, raffia, or twine. Yep, a toilet roll centre. Nothing but the best here at the Country Skills Blog! Start by wrapping the cardboard roll in a piece of wrapping paper – I had some gold tissue paper lying around, so I used that. Tuck in the ends. Now flatten the tube. This is the cute bit. Simply fold the ends towards the centre to form a small curved box. You’ll need to form the fold along a bit of a curve. It’s worth playing with an unwrapped tube first, just to get a sense of the shape you’re after. Hell, it’s something to do instead of the sudoku while you’re sitting on the throne! And here’s your completed box. Just tuck whatever special little gift you’re wrapping inside, perhaps folded into an extra piece of tissue paper, and tie it up in a bow with some ribbon, raffia, twine or even knitting yarn! Gift boxes can be so expensive – this one looks a million dollars, is a great solution to the ‘fiddly little package’ problem, and costs nothing! I was going to show you a bigger one made from a section of wrapping paper tube, but Dave thought better of the idea. He says you all seem like smart people and he’s sure you can work it out for yourselves! Now I’ve got a little confession to make – last night, while I was writing up the hazel and twine Christmas star decorations, I took my eye off the advent candle and we got a bit ahead of ourselves – all of today’s candle burned and half of tomorrow’s! Oops! It looks a bit sad tonight! I’m trying to write a post a day during Advent, so, please come along with me while I try to Blog Advent – the Country Skills Way – and forgive me if I don’t quite manage it! Oh no – you’ve got a Halloween party this evening, and to call your costume an afterthought is, sadly, dramatically to over-estimate the amount of thought that has actually gone into it so far! We’re just back from a lovely week in Cornwall, eating great food and walking the dog on the beach. I’d completely forgotten about our village pub’s ‘costume optional’ Halloween event this evening until we got home about an hour ago! But, all is not lost. Look at my natty outfit (kindly modelled here by Hubby)! 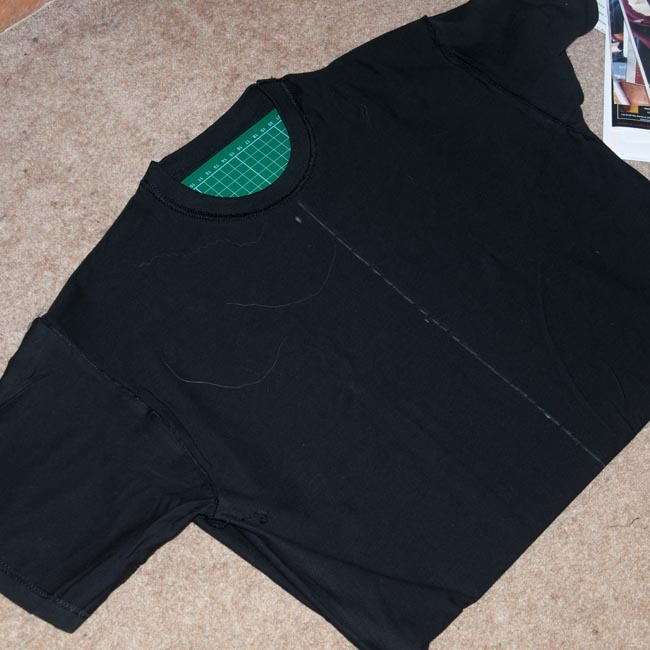 Starting with the black t-shirt inside out, mark out the centre line as best you can. This will be surprisingly difficult to do with any accuracy as the quality control on these things is always shockingly poor, so a decent best guess at it is perfectly alright. Next, using the tailor’s chalk, mark out a set of ribs to one side of your centre line. 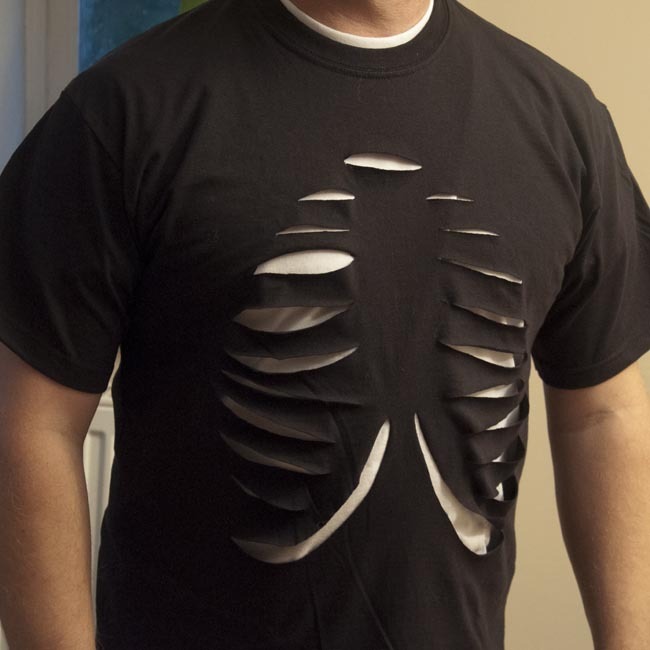 There are lots of rib cages in google images to look at, and I found the PDF template for a much more complicated version of this project on marthastewart.com was a useful guide to the general size and shape of the ribs. Remember to offer up to the white shirt you’re planning to wear underneath to make sure you’re not massively ‘out’ when it comes to necklines. 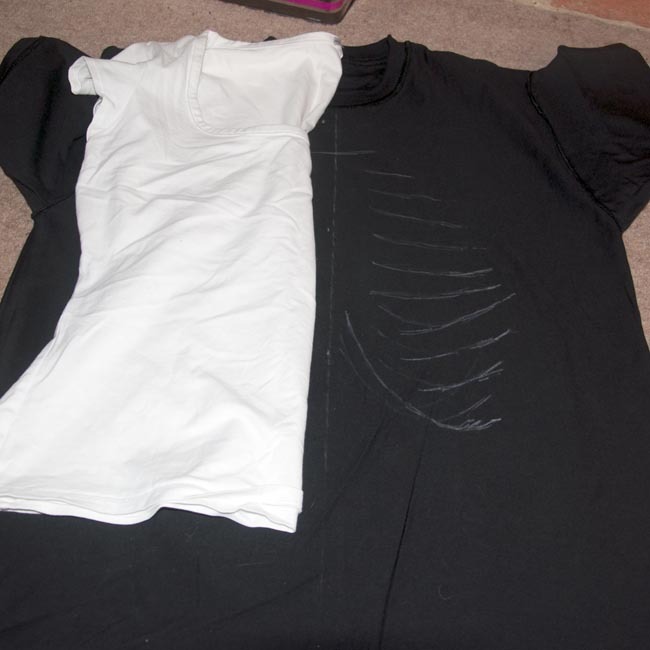 Now, fold the t-shirt in half along your centre line, so that you have both halves of the front of the shirt front-to-front and your chalk markings showing, and the cutting mat underneath. 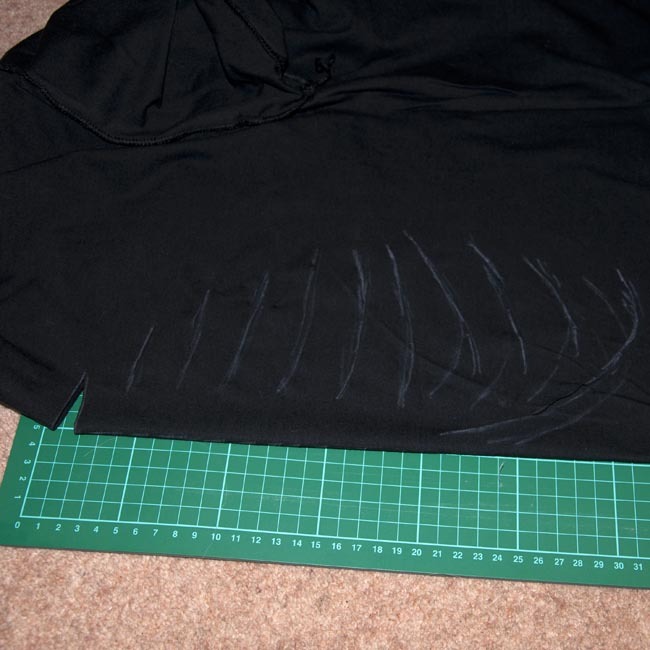 Cut carefully along the rib markings with your cutting wheel, through both layers of t-shirt, so that the pattern is cut as close as possible to identically on both sides of your chest. 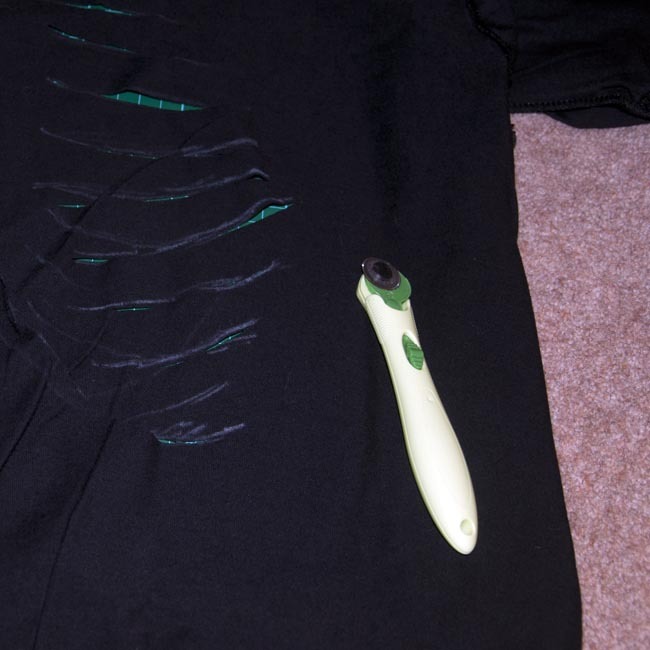 That’s it, unfold your t-shirt, and put the cutting mat inside so you can tidy up any bits the cutter hasn’t cut cleanly. And you’re done. Simple, or what? 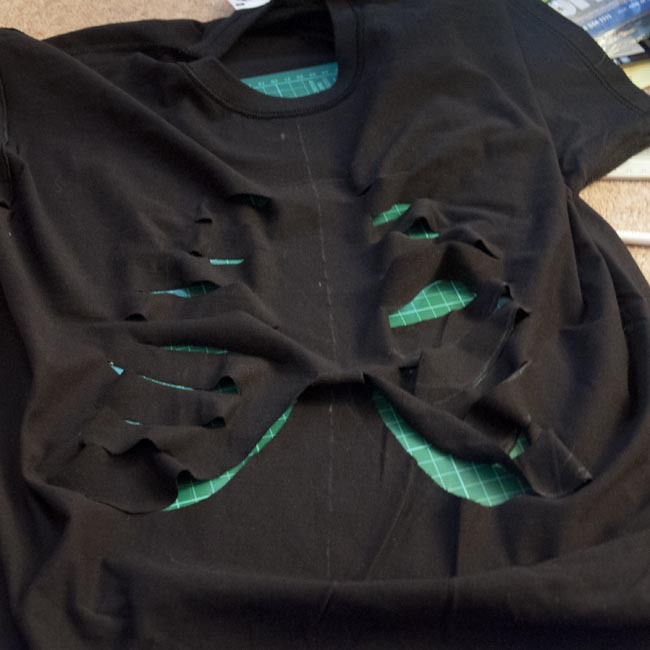 You could do the back now – but don’t cut the same pattern, as the back of the rib cage differs quite a bit from the front! But if you can’t be bothered, pair it with a cape (or a long dark coat! ), dark trousers or a black skirt and knee boots, and – if you’re feeling especially keen! – a scythe made from a broomstick with a cardboard and tinfoil blade. You’re all set! Time to get ready to party without feeling like you’ve completely failed to go to any trouble! Enjoy your parties, folks, and have a ghoulish good time! I have a confession to make – I can be a bit of a hoarder! I’m at my worst when it comes to clothes, even when they’re worn out, damaged, or utterly unsuitable, not even good enough for the charity shop, I look at all the lovely fabric and can’t bring myself to throw them out. Instead, they end up pushed to the back of the cupboard, or in bags and piles for ‘doing something with’, one day. 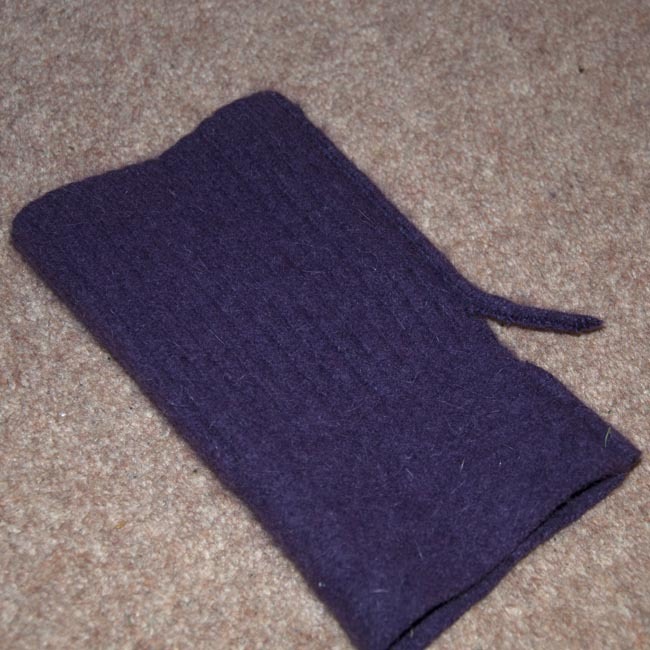 Browsing around the web a few months ago, I came across a reference to washing-machine felt, a technique for taking unwanted woollen knitwear and turning it into a wool felt which can then be used in other projects. All the tutorials I found seemed to hinge on also having access to a tumble dryer (which I don’t), but I had a dig about in the back of the wardrobe, rounded up three dead jumpers (two of which had already suffered and shrunk a little in the wash) and decided to give it a go. It’s important that the jumpers you’re felting are entirely – or almost entirely – made of natural woollen fibre, as polyester and other synthetics won’t felt properly. Mine ranged from 80% to 100% wool. 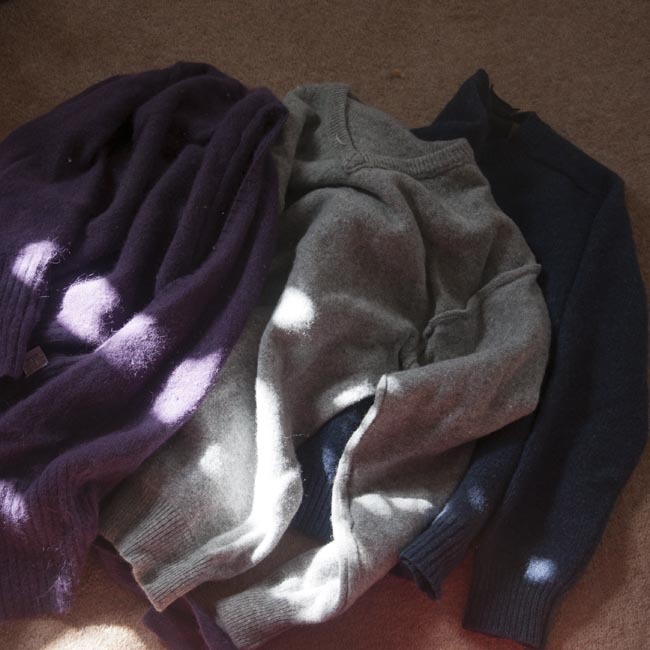 I threw them all in the washing machine with a scoop of normal detergent, and selected a 60 degree cotton wash with all the ‘extras’ selected – extra dirty, extra spin, you know the sort of things. Kids, this is not a good or friendly thing to do to knitwear (do kids these days even wear woollens??). The jumpers came out of the machine half the size they went in, and undeniably now made of felt. Success – and no dryer required! After a couple of days drying, I was ready to have a play. The fabric you’ve made will now behave very much like manufactured felt (though it’s a bit thicker than the stuff you buy by the square foot at the craft shop – and rather more robust) or polar fleece. You can cut it without it unravelling, and the edges don’t need finishing. 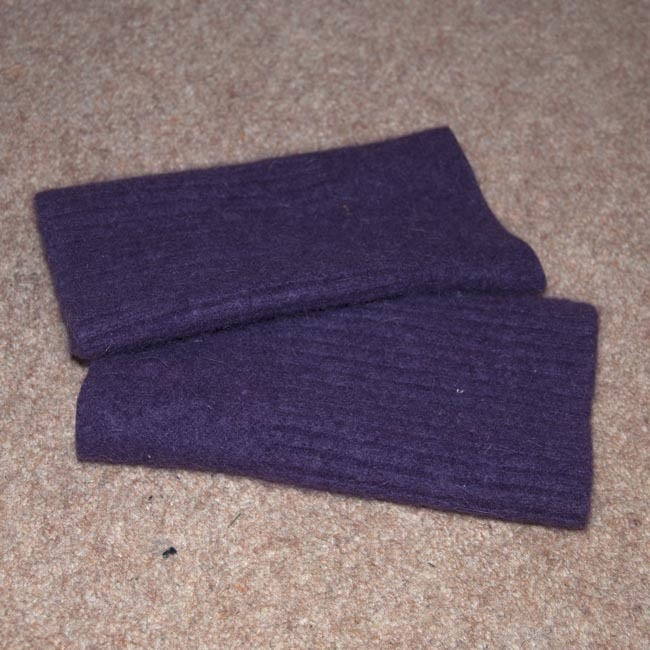 For a really quick satisfying up-cycle from your first washing machine felt sweater, how about a pair of fingerless felt gloves? 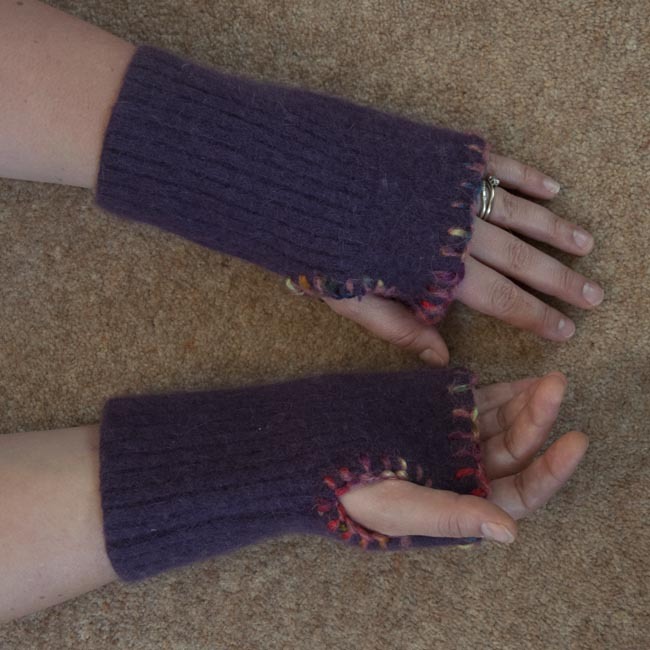 Work out how long you want your gloves, and cut the appropriate length from the sleeves of the felted jumper. You’ll probably want the cuffs of the sleeves to be the cuffs of the new gloves. 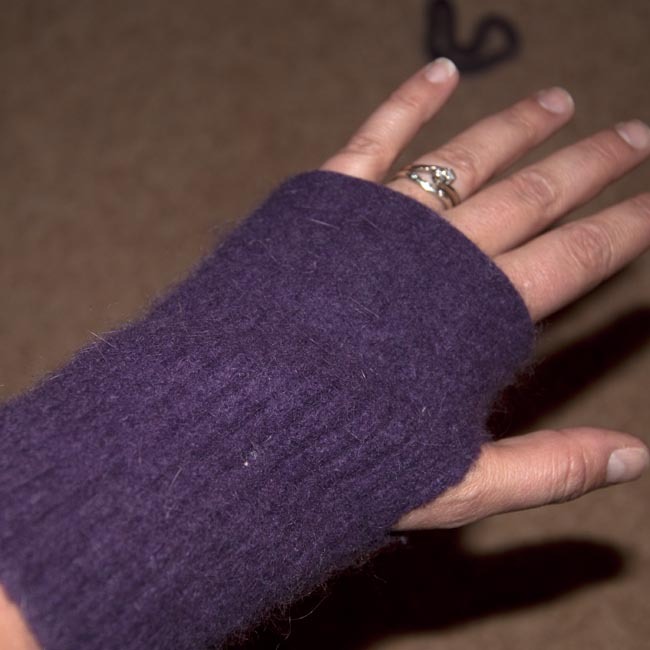 Now decide where you want your thumb holes, turn the sleeves inside out, and snip out that part of the seam from the inside of the sleeve, leaving a slit of the right length to fit your thumb through. Err on the small size, you can always cut more later. That’s it, if you want it to be! Not even five minutes work. But you can embellish these gloves really easily, if you like. The sky’s the limit, really, for embroidery and embellishment, but I decided simply to add some blanket stitch to the unfinished edges and thumb holes, using some pretty multicoloured contrasting knitting wool I had lying around. Blanket stitching the cut edges, like I did, has the added bonus that it should stop the seam coming undone as time goes by. 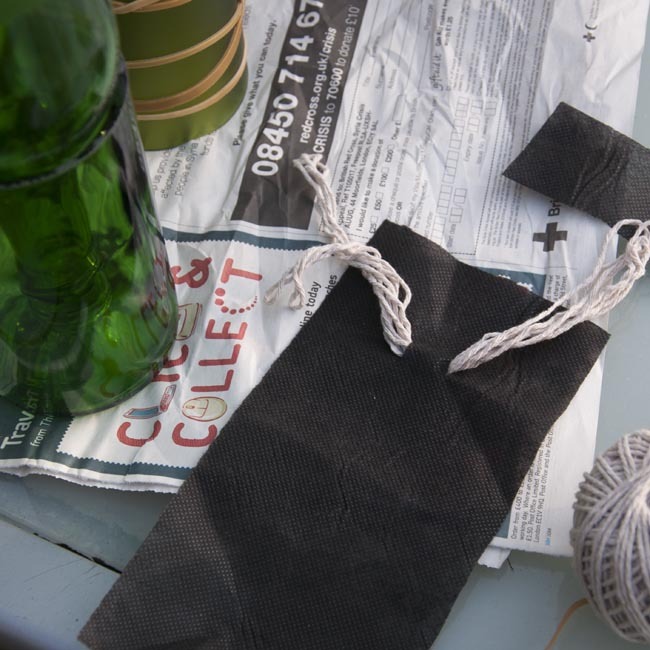 Quickest, simplest fabric recycling project ever, isn’t it? Anyone can do this, so give it a go! Clucking Mayhem – introductions, is the worst over? Five weeks ago, I drove a 200 mile round trip to bring home three new hens to add to my little backyard flock. Introducing new hens is always a difficult process, they can be remarkably opinionated creatures and don’t enjoy having new housemates! The ‘pecking order’ is a very real, and sometimes rather violent thing. For the sake of both my new and existing hens, I wanted to achieve as gentle and stress-free an introduction process as I possibly could, and made arrangements to take my time about it. You can catch up with the story so far, from coming home, first introductions, and settling in together. 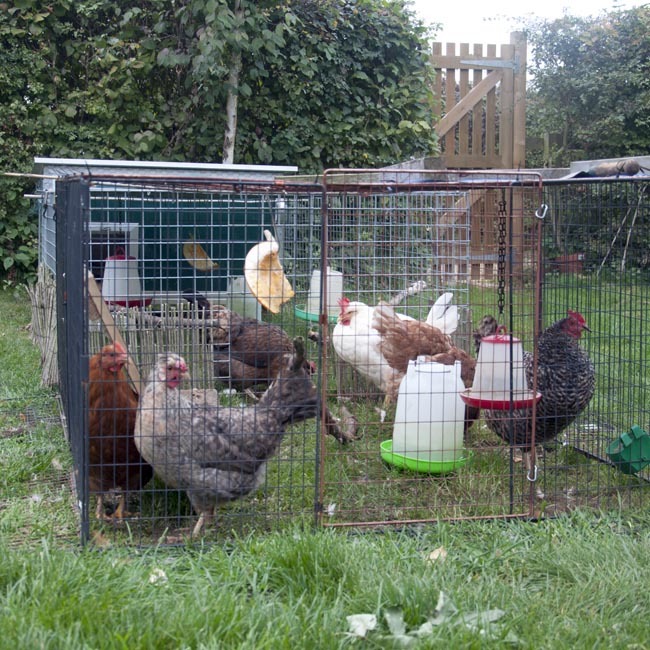 The weekend before last, once the hens were reasonably settled living together, but sleeping mostly apart, I took the second henhouse out of the run, leaving a dodge-board for the small girls to get out of sight behind if necessary. There was a bit of stress around bedtime the first couple of nights, but the girls are now all bedding down comfortably side by side on the perches, and during the day, apart from the odd scuffle, are mixing, feeding, preening and generally getting on with happy relaxed henny-things! Egg production is down, but then it’s well into autumn and more dark than light these days so that’s hardly surprising. Flora continues to wear her bit – her behaviour is the last remaining problem, it’s not really her fault, I suppose, but things would be really nice and settled without her disturbing influence on the flock. I think – though it might be wishful thinking – that the frequency and savagery of her attempted attacks on the other girls are reducing a little. With a bit of luck, in another month or so, the headgear can come off. In the meantime it seems to be causing her very little difficulty, she’s eating well and laying better than anyone else at the moment, giving an egg almost every day. Midge is growing up fast, with more comb and wattle than she had when she first arrived, and a hunger to match the growth rate. I’d love to think we’d get some eggs from her soon, though I suppose it may not be until spring. With a bit of luck – though I hate to put it in black and white and jinx it! – things are settling nicely now. I had in mind that things would take about a month to bed down and we’re pretty much on that target. I really hope the girls can get on with enjoying their seasonal treats (the Halloween pumpkins are going down rather well just now!) and lay me lots of nice tasty eggs for a long time to come! The chimney sweep came this week, and with the equinox just passed, the nights are palpably drawing in. 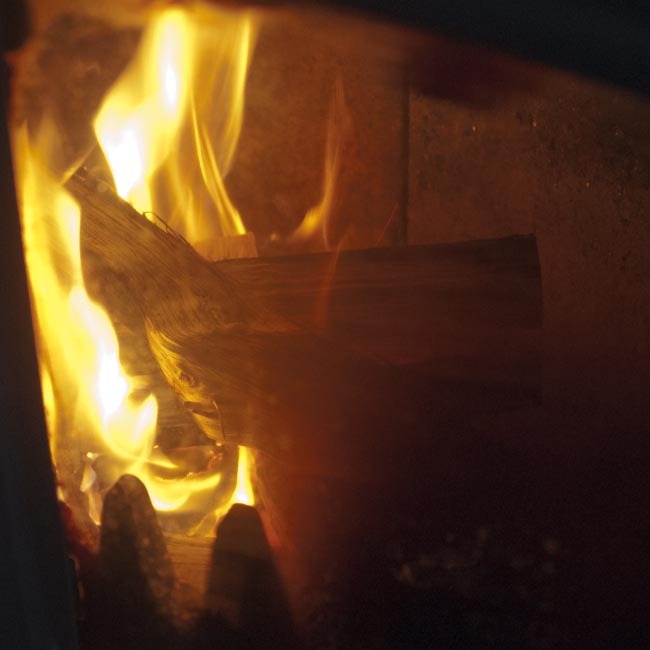 We use the wood-burning stove in our living room for an awful lot of our heating in the winter – the alternative for us, living off the beaten track (and off the gas main!) is our oil-fired boiler, which is both expensive and not terribly environmentally considerate. But even if you’re not using your fire daily, there’s nothing better than a real wood fire as the nights get colder and darker! We have a fire most nights in the winter, and that brings with it a requirement for firelighting. We cut our own kindling wood from our log supply (well, I say ‘we’ – Hubby does it!) so it’s not as tinder-dry as the bags of kiln-dried kindling sticks you can buy at great expense. 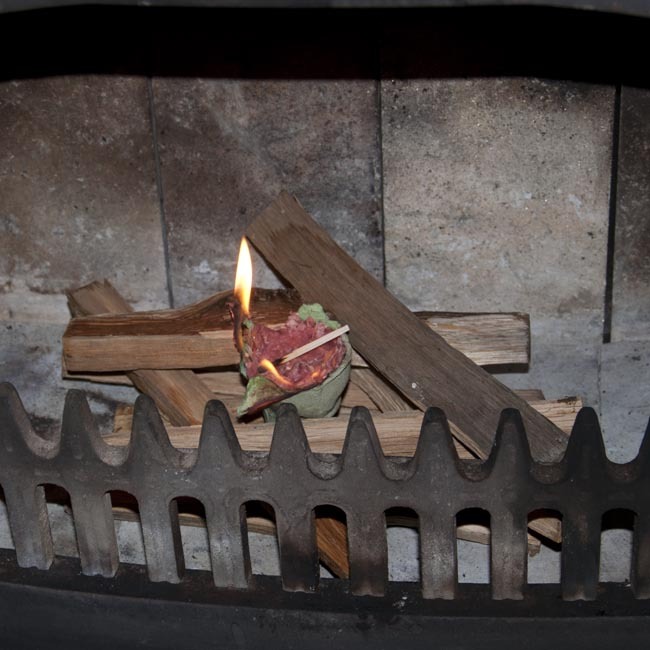 While I’ve succeeded in lighting the fire with newspaper, cardboard and kindling, it’s a frustrating exercise, doesn’t always work first time, and we tend to use a firelighter to get the kindling going nice and quickly and conveniently. There’s only one downside – the white firelighter blocks you get from the co-op or the garage *stink* of kerosene. I don’t want them in my living room! And while I occasionally see the nicer wax & sawdust type for sale locally, I can’t buy them reliably. But they gave me an idea – with the waste-wax I have available from old candles (believe me, I’m really bad at throwing things away, even stuff like this! ), the really grotty old stuff that really can’t be recycled into new candles, from melt pools, stained with soot, with old wick and ash and even match-heads in it, in different colours and scents, could I make my own? You want about equal volumes of wax and closely packed wood shavings. I was hoping to use some wood-shop waste, to make the whole thing completely free and recycled, but the stuff I could get hold of was too fine and dusty and mixed with big chunks of ‘stuff’. I think the shavings produced when hubby breaks out the wood-turning lathe would be ideal, so I’ll save those in future. For this batch I used a cup of wood shavings I stole from the supply we keep for the henhouse, it’s a tiny amount and probably cost a couple of pence at most (and technically I suppose is a recycled by-product, anyway!). You also want an egg box (I had a few old dozen-sized egg boxes that have been damaged beyond useful re-use), and a double-boiler arrangement for melting your wax, preferably with an inner container you don’t want to use again for ‘clean’ candle-making, and a thermometer for safety. 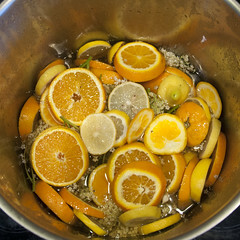 Take your dirty grotty old wax and put it all into the double boiler, and heat the water up to about 75 degrees celsius. This should allow you to melt the wax down without getting too close to the flash point of your wax. I’ve used an old can which previously held malt extract for home-brewing, it’s about the perfect size for melting candle wax. Really, any dirty old wax goes here, and don’t worry about trying to remove old bits of burnt or unburnt wick, wick sustainers, matchsticks, or anything like that. Add more wax in stages as the contents of the can melt down, until you have the sort of volume of melted wax you need (it was about 1/3rd of the can, once melted, for me). This part of the process is where my caveat comes in – it took a bit over an hour to melt down all this wax, during which I couldn’t really leave the wax unattended on the stove (though I did get the chance to have a nice chat on the phone with my little sister). The time investment in making these as a standalone project probably, for me at least, make the cost / benefit of this project a bit suspect! There may be ways around this, more of which later! Once all your grotty old wax has melted down (it will smell quite peculiar if, like mine, it contains fruity, citrussy and maple-syrup scented candle-waxes! 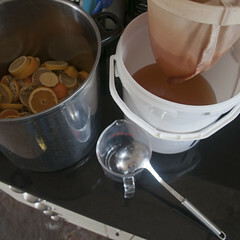 ), add your shavings in batches, stirring as you go. 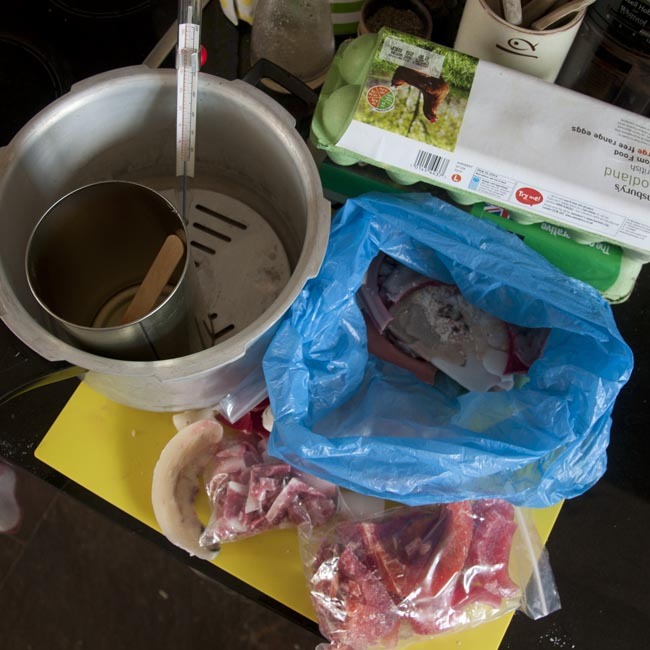 You want most of the wax to be absorbed into the shavings, leaving just a little bit of ‘free’ wax to set the mix as it cools. Pack the mix into the wells of the egg boxes, filling them to the top, and squeeze down the contents with your fingers (wait for it to cool partially before doing this, if you like). My mix made an almost perfect dozen firelighters (I also made two ‘experimental’ lighters with rolled-up cardboard in the well). Allow the firelighters to cool, and then separate them (tear, or cut into the underside of the egg carton to get things going). 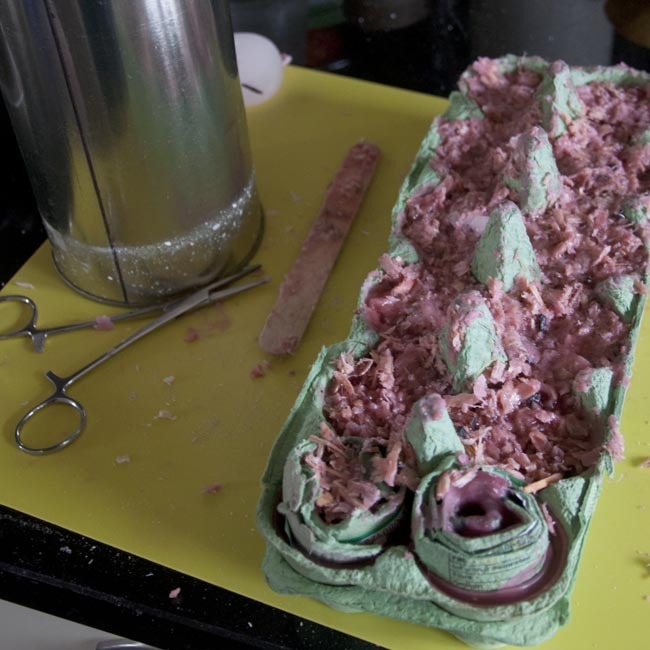 Mine look like rather suspect pink raw minced beef products because of the red waxes that went into the mix! There’s a very subtle smell about them if you stick them right up to your nose, but nothing unpleasant. So far so good, right? But it’s all ‘for nowt’ if they don’t actually light fires! Would they do the job? Would all the wax melt and dribble out and make a mess of my lovely newly-serviced wood stove? Build your kindling ‘jenga pile’, and nestle the fire lighter in the centre. Then set fire to the cardboard edge of the lighter with a match, and watch it go! It burned amazingly well, cleanly, with no wax dripping, and got up to a really good temperature, the kindling wood was snapping, fizzing and crackling almost immediately and the fire got off to a roaring start! I suspect actually about half the total volume of firelighter would have done the job – a whole egg-well seemed a bit generous. I might under-fill the wells a bit in future and see if it still does the job. But ‘in future’, if the process is this time consuming? Well, if the performance of these firelighters weren’t quite so good, I suspect I wouldn’t be making them again. 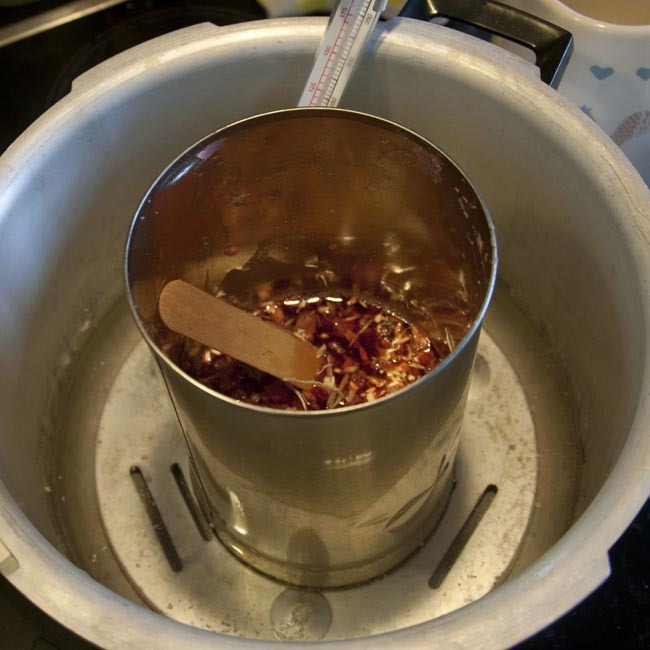 I think it will be a task that I do ‘in the background’ in a second can when I’m using the double-boiler for clean candle-making anyway (I’ll be doing quite a bit of this in the build up to Christmas!). 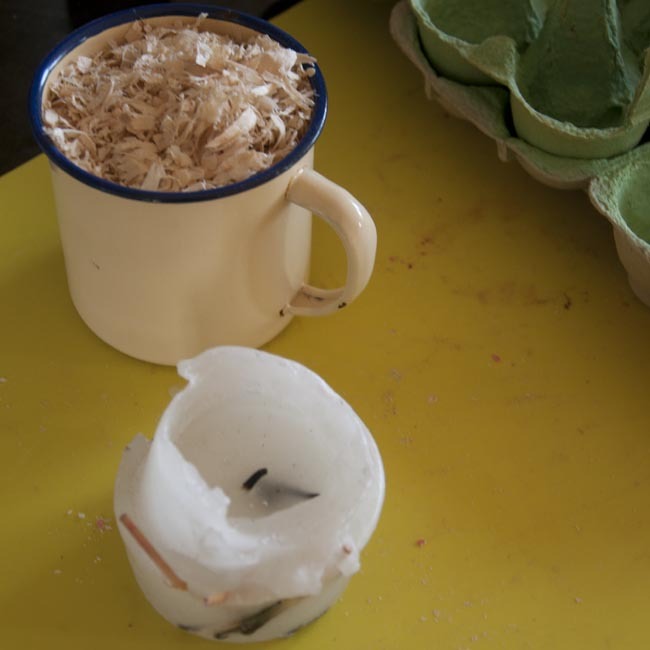 If you’re doing any similar candle craft, and have space for a second melting pot (or if you have one of those natty thermostatically controlled wax melting gadgets that you can set-and-forget to a greater extent) then I can thoroughly recommend making these free, recycled little firelighters. 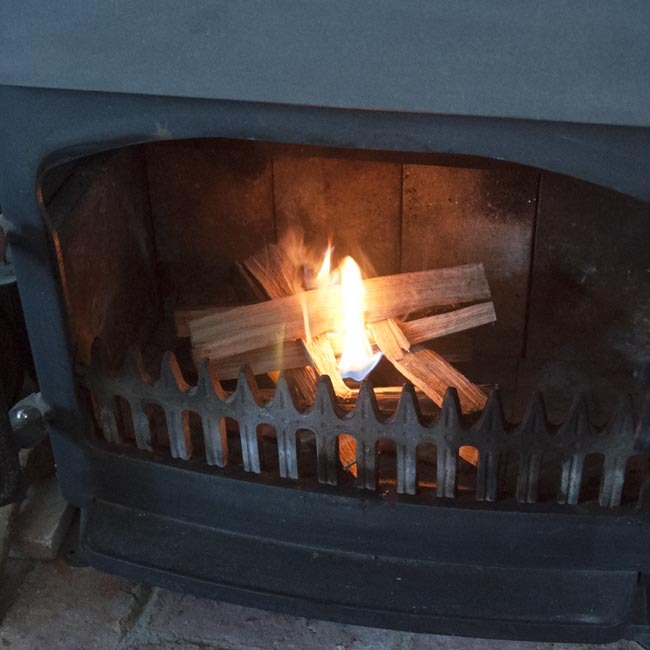 Enjoy your fires this winter, folks (and have a look at my useful little tip for cleaning the glass on a wood-burning stove, while you’re at it)! 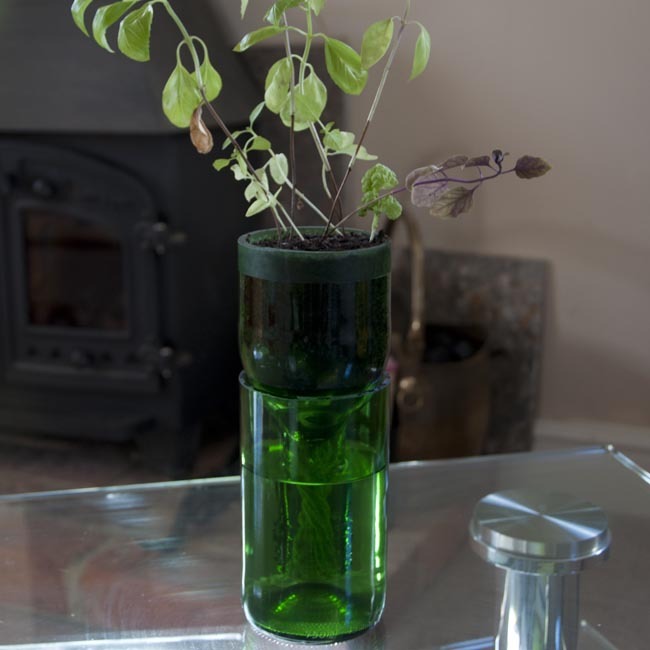 Using Your Bottle – self-watering planter success! Earlier in the week I wrote about my last batch of bottle cutting experiments. 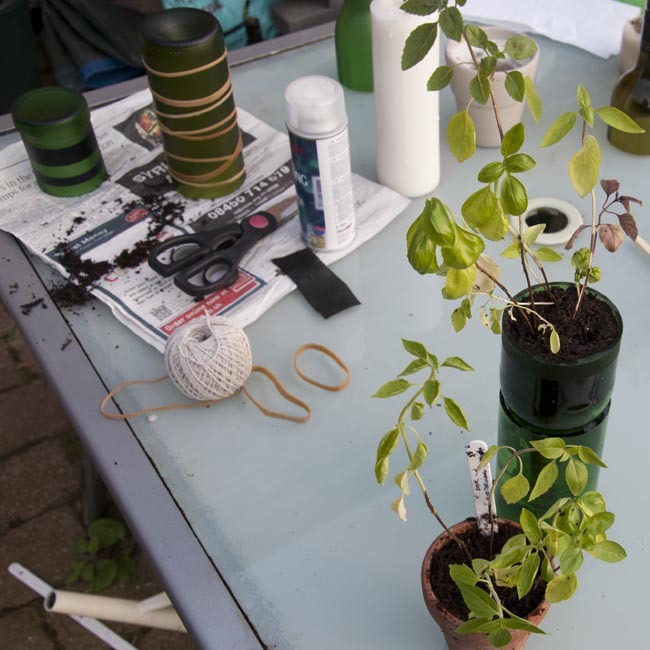 Just a quick post to update, especially about the self-watering planter which, I had to admit, I had my doubts about! Well, it works! The compost is staying moist, the water level in the reservoir is very slowly – but visibly – dropping, and the basil seems to be thriving! There seems to be an added bonus with this design, which is that the glass captures the heat from sunshine much more effectively than traditional pots. The soil feels quite warm to the touch on a sunny day, which can only do good things for the plants’ growth over the winter, right? So, many more of these to come, I think! Hubby not too sure about me filling up our windowsills with recycled wine bottles, but I’m sure he’ll come around! I’ve been wanting to play some more with the bottle cutting jig since my first attempts at bottle cutting a few weeks ago. This weekend I found a few hours and raided some bottles from the neighbours’ recycling bins, and got to work. My success rate this time stayed stubbornly around the 1:3 mark. It’s becoming clear that two things are combining to be a problem. The first is that accuracy in the score mark is absolutely critical – if you don’t get a perfectly straight even score that meets neatly, there’s no chance of the bottle breaking cleanly. The second is that bottles are *rubbish*. Of the bottles I’ve cut – and failed to cut – so far, not one is made up of even thickness glass, and most of them aren’t even anywhere near round in section! This makes getting an even score more challenging, as well as tending to make the bottle break unevenly as a result of the variable thickness of glass. There are a handful of gadgets on the market (and one interesting looking one, called the Kinkajou, about to come on the market) which might well improve my hit rate on nice reliable score lines, but I’m still trying to keep this a low-cost hobby for now! Still, a couple of hours work (mostly removing labels!) 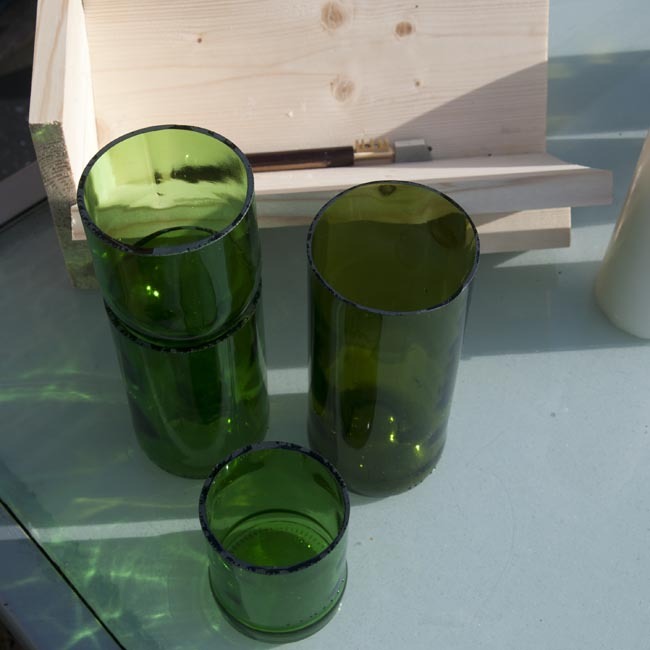 got me three new nicely cut bottles – a 500ml green cider bottle, and two punt-bottled wine bottles, one of which I cut long, and discarded the top to make a vase, and the other cut more centrally to give a top and bottom section. Sanding down (see my previous post for more details of the cutting process) gave me safe cut edges. I’ve really wanted to play with etching, because I’ve seen some beautiful glass decorating projects, but hubby really wasn’t very enamoured with the idea of me using concentrated acid paste in the kitchen (and I can kind of see his point!). I settled on using some frosted-glass effect spray paint made by plastikote. This slightly offends one of my fundamental design principles, actually, but never mind! The ideas for using the bottles were mostly gleaned from Pinterest, which is a new and rather addictive time-sink (those of you who’ve also discovered this can have a browse of my boards here). I used some black sticky-back vinyl as a masking material for two of the pieces. Isn’t it great when you discover that the bits and bobs you’ve bought for one craft can be pressed into service for another? I dug out the rotary cutter, ruler and cutting mat I bought for quilting, and got to work cutting strips of vinyl. 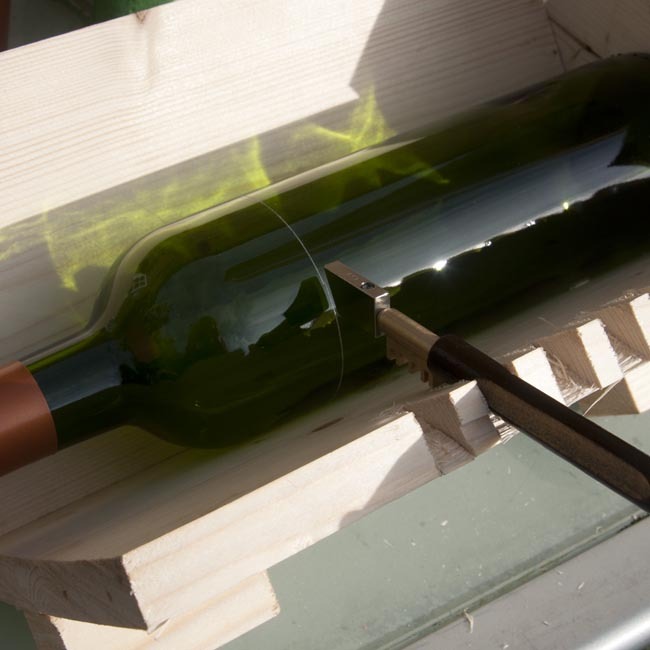 Two to wrap around the bottom of the cider bottle, to give a striped finish, and the off-cut with some newspaper to mask off all but the edge of the cut-off top of the wine bottle. 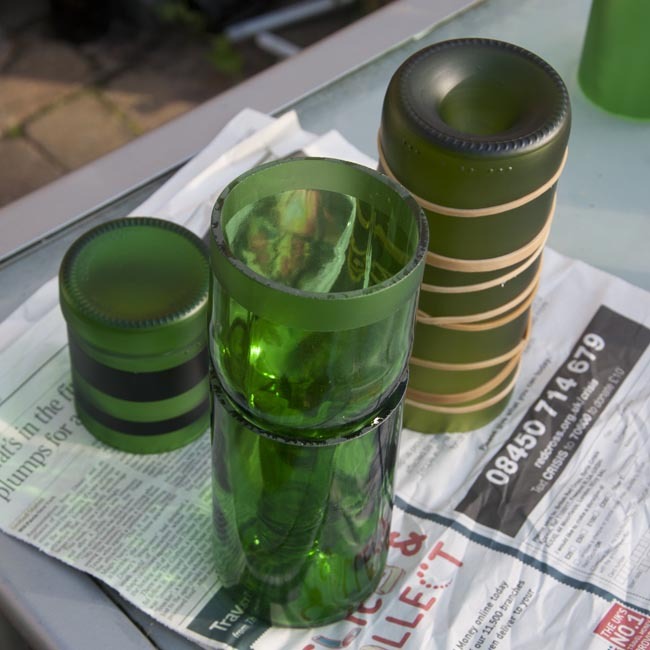 This vinyl is a great masking material for glass, as it adheres tightly, stretches just a little to account for the wonkiness of the bottles, and comes away cleanly without leaving any residue. 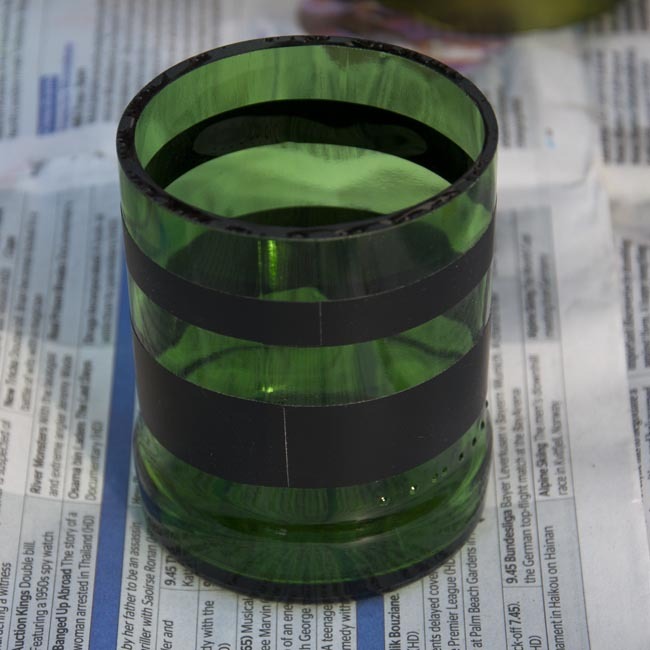 The resulting cider bottle makes a very pretty tealight holder which would make a lovely little gift. 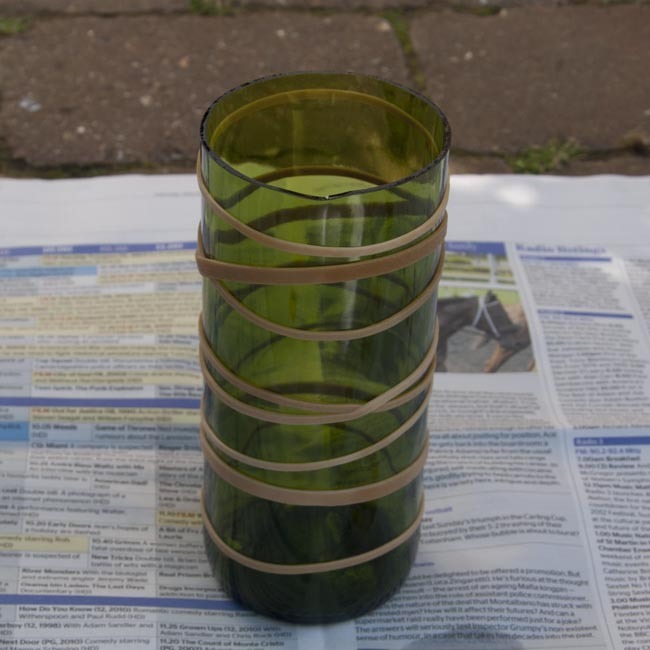 For the bottle destined to be a vase, I borrowed another idea in wide circulation on pinterest and applied rubber bands, some overlapping, rising and falling. The first thing to note about this approach is that the rubber bands don’t arrange themselves – it actually takes quite a lot of faffing to get a pleasing arrangement of lines. They’re not an ideal masking material, either. 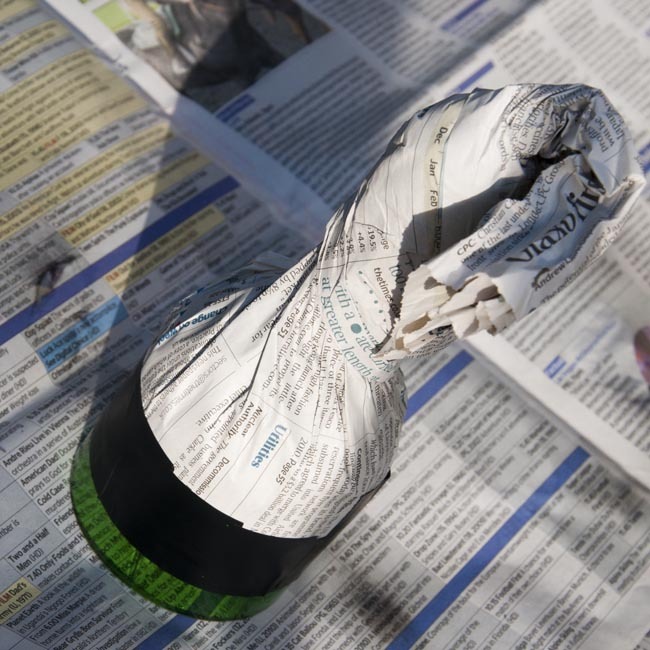 As you apply the instructed two or three layers of the frosting paint, some will settle on the top edge of the rubber bands (this is much less of a problem with vinyl which is very thin and doesn’t collect ‘overspray’ in this way). The rubber bands came off easily once the paint had dried overnight, but it took quite a lot of delicate trimming away of the extra paint with a scalpel blade to get a reasonable finish. I’m still not entirely happy with the outcome, and if I try this approach again I’ll try to get away with one, perhaps two layers of paint rather than the three I used. Still, the result is quite pretty, isn’t it? Dave said he wanted to be in the photo, and who am I to disappoint him? Finally, and perhaps most interesting for me, is the bottle cut in half. 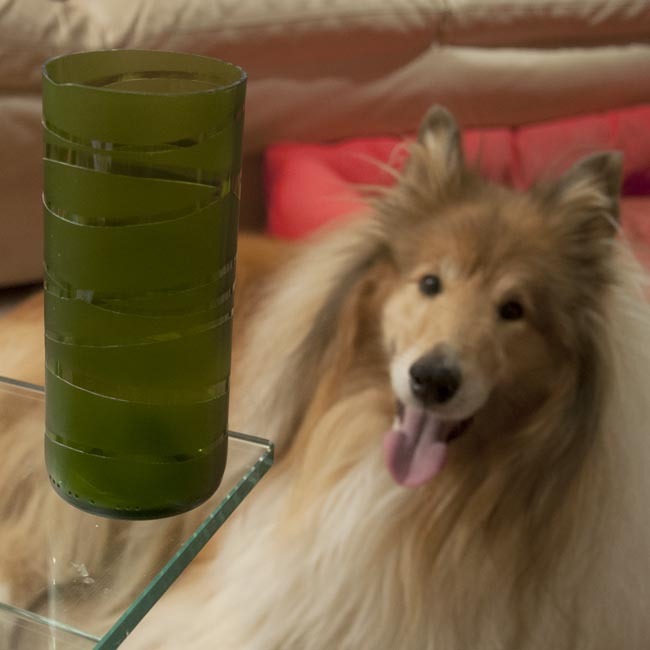 I’ve made a self-watering herb planter, based on a photo I saw – guess where? – that’s right, pinterest again. The top of the bottle is up-ended inside the bottom. I lined it with a cut rectangle of landscape fabric about 4″ by 8″, one half of which I threaded through with a bunch of jute string. Fold this in half with the string dangling through the neck of the bottle. Then, fill with compost and plant (in my case, with some rather sorry-looking home-grown basil I always forget to water). This is where I admit to being a really neglectful gardner. I’m full of enthusiasm, but when it comes down to it I have a nasty habit of forgetting to water, to pot on, to plant out… my garden thrives on it’s own resources more than on my care, and my houseplants have to have a strong will to survive! So if this contraption actually works (and the jury is still out on this – it’s early days) then it’s going to change my window-sill gardening forever. Herbs that will water themselves! In a planter which is recycled, free, and really pretty, rather than something ugly and plastic and more suited to greenhouse shelving than living room windows.